From Anonymous of Norfolk, Virginia on 1/5/2010 . From Marci Heckers of Claremont, California on 10/15/2003 . From Sandra Pedersen of Neenah, Wisconsin on 8/15/2003 . 4/19/2014 – Is the Homestyle bread gluten-free? Our church is looking for a gluten- free bread for communion and I wasn't sure if it . 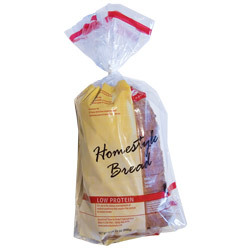 . .
4/14/2014 – If stored as directed, what is the shelf life for your Homestyle Bread? 2/22/2006 – Did the homestyle bread change? The loaf looks different and my daughter told me that it taste different.